I couldn’t find the lighting calculator I previously saw. Please share any lighting tips or information you have in the comments. Thanks! Here’s my setup. My shop is 20′ x 20′ with a 10′ ceiling. 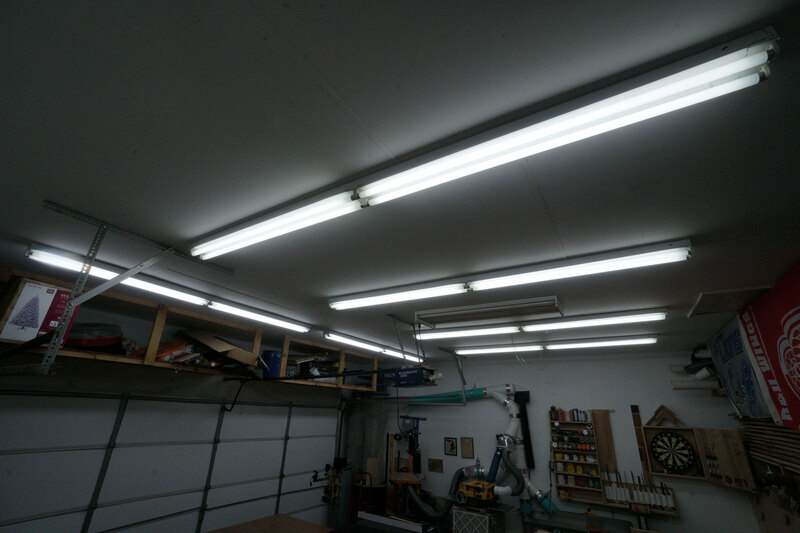 I have two 8′ fixtures with four 4′ bulbs per fixture above the garage door on a separate circuit to turn them off when the door is open. I also have four identical 8′ fixtures with four 4′ bulbs per fixture above the main work area on a separate circuit. Every bulb is a 6500k T8 bulb. I had expected to actually see the lights in your shop. Sorry, I forgot to update the text this morning before it posted. It’s updated with pictures now. Time for coffee. One of the best deals I’ve found in lighting are the 4′ LED shop lights you can buy at Costco. The color temp is 4000K, which is on the white side, but not as blue as daylight bulbs. Each fixture is 3700 lumens–very bright, and uses 42 watts. They can hang on chains (included) or can be flush mounted (they are very light weight and easy to handle). Also, they can be daisy-changed together (they have a cord that plugs in and a receptacle so you can plug in second light into the first one. If you have an existing ceiling box, it’s an easy matter to put a receptacle in the box and just plug in these lights. I have these installed throughout my shop, laundry room, and basement. They give great light and can be found on sale for under $25 (if I remember right). 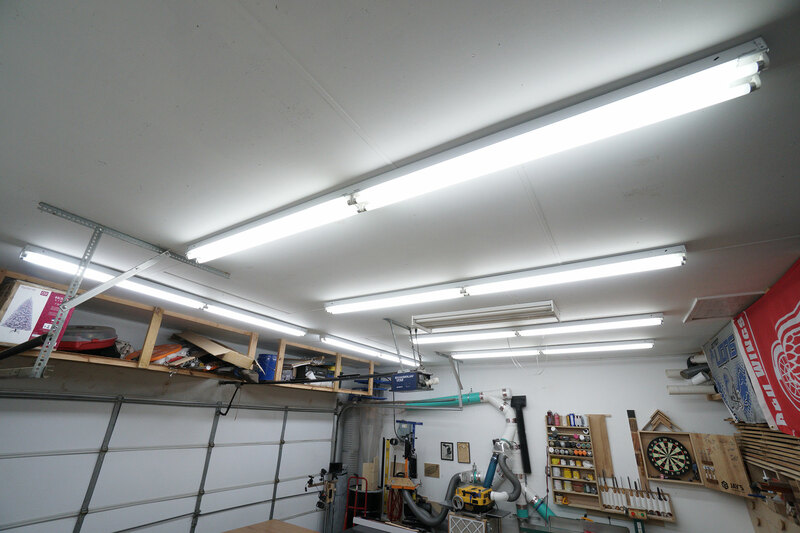 Another important point if you have an unheated shop space is that LEDs will turn on in very cold weather–regular fluorescents will not–you need the special low-temp ones for cold weather, which require a special fixture. Note: I do not work for Costco or own their stock–just love these fixtures. Sorry for the long comment, but I hope this info helps. Costco reduced the price to 14.97 then 9.97 before depleting their supply. They are no longer available. Their $40 replacement is bulkier and has unnecessary dimming and motion-sensing features, but nice nonetheless. I wish I had gotten more than one which I delayed in testing out. I would have papered my ceiling with them. LEDs are the way to go. 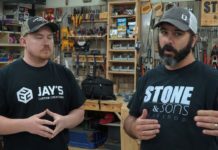 I just built a shop and all of the lighting in it is LED. Many of the fixtures came from Costco. These fixtures are 4′ long and can be daisy chained together. I agree the more light you have the better and as you get older it becomes even more so. I have a Android phone with a light meter that measures LUX, it is called Lux Easy Light Meter. Thanks for all your hard work. You and Shawn do a wonderful job. Constructive criticism: You should explain your technical terms better to eliminate confusion. For example: “T8”. This is a rating system to designate the diameter of fluorescent bulbs calculated in 1/8ths of an inch. Therefore, a one inch diameter tube is 8 eighths; which translates to a T8 bulb. The big, old 1 1/2″ diameter fluorescent tubes are designated as “T12”; which translates to 12 eighths. The smaller “T5” tubes are 5/8ths of an inch in diameter. Additionally, The T8 fluorescent fixtures can easily be upgraded to LED with direct replacement LED tubes. These go in just like you are replacing a bad fluorescent tube. The only caveat is that your fixture must have the newer electronic ballast — which, if it is a T8 fixture, it will almost certainly have. (It will be clearly identified on the ballast itself.) And just like your fluorescent tubes — pay attention to your light temperature (Kelvin) ratings. They are still a bit expensive, but well worth a trial in a fixture to see if they make the upgrade worth it. 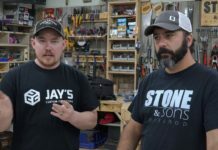 I have the same exact lights that Jay has in has in his shop and I really like them. My shop is 24′ X 25′. I have 4 rows of 8′ lights. I was going to put just 3 rows but the electrician friend that was helping me told me to go with 4 rows and to use daylight T-8 bulbs. LEDs were just to expensive. He had a lot of experience putting in lighting in shops. I am so glad I listened to him. About 6 months ago I switched to LED, a little costly. However, the lighting is so much better and I’m not replacing lamps every few weeks. A four foot LED fixture from Costco about $35, will easily replace 2 four foot florescence. I have 3 T8 fixtures, each holds 4 tubes. Initially I found it was more than bright enough. 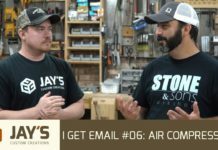 Because I’m mainly in the shop during the winter, I had to install cold weather ballasts. Over the last few years, the lighting seems to have degraded. I purchased some T8 LED replacements, but they would only work in some of my fixtures. I was at Costco recently and found 4′ LED fixtures on sale, so I bought a couple and was surprised at how bright they are. I read somewhere that fluorescent lights tend to get progressively dimmer while LED’s either work or they don’t and don’t dim over time. I’m planning on eventually replacing all of my lighting with LED due to the lower power consumption and the fact that they are instant on – my T8’s take a few minutes to warm up and get to full brightness.